Simon J. Charlton is a past contributor to Synchronized Chaos magazine. He may be reached for questions or comments at simonjohncharlton@gmail.com. A regular shtick in the old Peanuts cartoons would show Lucy sitting behind a table on which rested a sign: “Psychology, 5 Cents.” This image kept running through our minds as we read The Feminine Manifesta by Lilly Hills and Karen Hudson. Not that this book lacks merit. Quite the contrary. But it is a conglomeration of pop psychology borrowed—with sources meticulously cited—from previous authors and used to support the authors’ goals. That goal is to improve the lives of those who need help—and that is worthwhile. Built around Karl Jung’s timeworn idea that everyone has both a masculine and feminine side, this “Manifesta” is a glorification of the feminine side, especially when it involves women appreciating and encouraging and recognizing the value in themselves, and in other women. It begins with the interesting point that women’s problems in the workplace are mostly with other women, that in a competitive work situation, where the masculine need to compete dominates, women can ease and enjoy their lives more by appreciating the qualities of their female coworkers, and working together–instead of competing with them. Bruce and Kathy Roberts may be reached at brobe60491@sbcglobal.net. 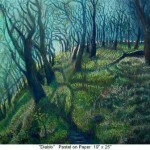 I am a painter and I use a range of mediums including acrylic, oil, and pastel. However, color and its power to evoke emotion is the defining aspect of my art. For many years, I discovered a rich arena of color in my cityscape work. Night intrigued me the most, as artificial light from street lamps and house windows, reflecting off of overcast skies, created a surprising range of color tones. The oranges and reds created by artificial light set against the quietude of the purple and blue night sky, with a variance of color in the shadows, evoked a powerful emotional environment. Urban images revealed landscapes of desolation, loneliness, and contemplation. As I moved away from strictly representational composition, working instead in an intensive technique of layers and layers of paint applied with small strokes and a small brush, time itself began to develop as an element in the work. During the process, the image inherently evolved. 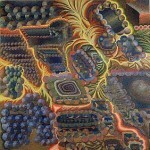 As the colors combined and reacted, new patterns emerged. Rather than adhering to a preconceived pattern of color, I followed the development of the color as it occurred. 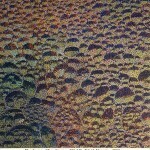 Viewers have commented that my method of applying paint seemed to resemble the technique in the Pointillist paintings of Seurat, whose work was groundbreaking and anticipated modern methods of color printing. While mindful of these amazing discoveries, as an artist, I am striving to combine the qualities of color that create an intrinsic reaction in the eye, in order to construct a visual atmosphere that invites contemplation and an emotional reaction in the viewer’s imagination. 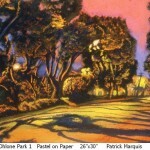 You can visit the artist’s Website at Patrickmarquis.com. Contact the artist by email at ampmnow@netzero.com. Arthur Schopenhauer once said for an individual to suffer was not to merely “understand” what the other was going through; rather to truly experience empathy is to take on the other’s suffering, to literally be crucified with another as opposed to simply carrying their cross, and Draper’s novel Out of my Mind seems to focus on the latter in this powerful novel. Following a fictitious autobiography of Melody, a young girl with a disability restraining her to the confines of a wheelchair and the inability to express any words whatsoever, the book seems to invoke some primal emotions that force one to no longer simply “read about” the character, but actually experience life with her. There is much to say about whether Draper is justified in writing this kind of work; however I find that discussing topics of that nature take us away from the whole point of the book and I’m much more concerned about what the book has to say then whether or not she should have said it. To begin with, I really appreciated the existential element to Draper’s narrative method. The book did not have a rigid structure which it adhered to, and consequently it became quainter as the story revealed itself, quite akin to a blossoming rose. This particular style would appear to be quite vexing insofar as it has no logical point that it could end per se. Any ending would appear disappointing to a reader in its lack of a formal conclusion. However, the open-ended style of the book is what gave it all its charm. The lack of any sense of ethos from Melody’s contemporaries did not derail the whole book; rather following the main character through her struggles and sharing in her perseverance seemed to endow her with stoic nobility. The inexcusable lack of justice experienced by her colleagues made me reminisce of the Aristotelian tragedy: one that is not viewed as to depress, but to reify certain virtues in the audience. This is what I was speaking of earlier with the modes of compassion and primal sensations: as incomparable misfortunes strike Melody and her family, she seems more whimsical than pathetic. Christopher Williams is an editor with Synchronized Chaos Magazine and may be reached at cwilli10@ashland.edu. Visit www.sharondraper.com for more information about the author. at the seized Chesapeake twilight. rushing a volcano in silence. with one cateracting eye closed. Andrew Rahal is Co-founder and Editor of poetry and non-fiction for the Nashville Review. He can be reached at Andrew.rahal@gmail.com. In the last few weeks, I have been given the opportunity to read not one, but two, poetry books by writers from California. Though both writers originated in the same state, that is all they have in common. The first book I received was “Hayward Hometown Poetry” by Bruce Roberts. This was a collection of poetry about his hometown, though saying it is only about the town is not completely accurate, as it is also about the residents of the town, and how the writer remembers the area. Mr. Roberts took a freestyle approach to his poetry, making it slightly more difficult to understand for a novice poetry reader. Some of the images that were brought forth in his writings made this reviewer wonder if he really loved the town, or if he loved what the town used to be, but is no longer. I was moved by one of his poems entitled, “Night School,” where he wrote about a former student of his, a woman whose 11 year old son had murdered a man. It described the writer’s disbelief of and heartache in the situation – also the questions he asked himself while facing the step-mother of an 11 year old killer. This poem would a cause reader to think and ponder the question ‘where is my baby at?’ Though I did not find his work to be especially emotionally moving or gut-wrenching, Mr. Roberts did do what he set out to do and successfully painted a clear, poetic picture of his views of Hayward California, his hometown. J’Rie Elliott may be reached at dixiepoet@gmail.com. Last weekend, Opera San José unveiled its production of The Barber of Seville. I attended the afternoon performance on Sunday, February 13th. Conductor Bryan Nies opened with the familiar overture…that is, familiar to opera experts as a classic masterpiece and to opera apprentices as a background to classic cartoons. However familiar one may be with the piece, it was a sincere joy to hear in person. As most of us are aware, an opera just isn’t an opera without romance, drama, and scheming and conniving characters. The Barber of Seville has all of these elements along with a whole lot of humor and silliness (e.g., hypnotism by way of a carrot or the intentionally poor mimicking of playing a musical instrument). It was all quite entertaining. All of the performers were very engaging and memorable in their own ways. The wit and charm seemed to come natural for Adam Meza as Figaro, the local barber and jack of all trades who offers to help bring Count Almaviva (Chester Pidduck) to his beloved Rosina (the vocally impressive Cathleen Candia). Scene-stealers included Kindra Scharich as Berta and Paul Murray as the quirky Basilio. Overall, I had a delightful experience watching the The Barber of Seville and I would encourage others to catch one of the remaining performances, which continues this weekend until Sunday, February 27, 2011. Click here to learn more about Opera San José, or here to purchase tickets for an upcoming show. Gloria Balderas is an editor with Synchronized Chaos Magazine and may be reached at globalderas@gmail.com for questions or comments.